Robotics grabbed mainstream headlines this April 2014, starting with the Economist’s 14-page special report on the “Rise of the Robots” written by a reporter who travelled the world to gather information and finally concluded that the rise of robots is “cool” – we agree! Then, following last month’s FAA news and an incident in which a triathlete was injured by a falling drone, some called for immediate limited commercial UAS use this April amidst fears that drone crashes could cause numerous headaches and lawsuits. However, at the DEMO conference, Helen Greiner, co-founder of iRobot, suggested that the outlook for and potential of drones overall is promising. UAVs also featured heavily in April’s business news, with a variety of items on acquisitions, for instance by the ECA Group and Google, summarized for us by Frank Tobe in his UAV news wrap-up. Overall, business news in April was once again positive with various deals being done, including Apple buying UK speech recognition firm Novauris and Google Ventures investing in robot maker Savioke. 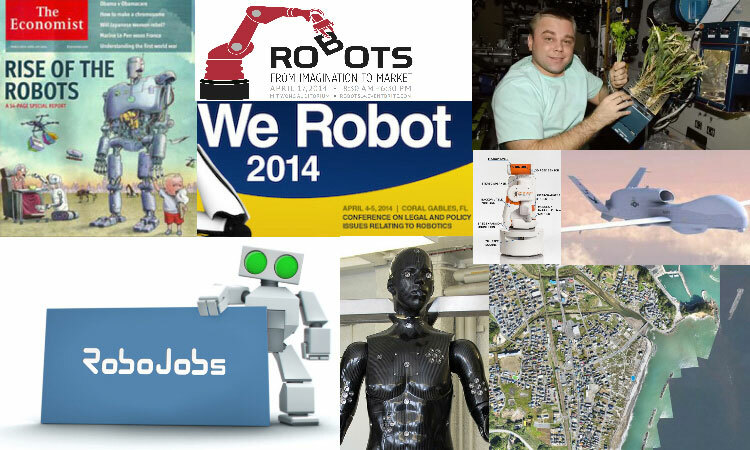 Robohub’s Frank Tobe picked up on some of these business developments and tried to shed light on what they might mean. Finally, following last month’s news that the NAO Next Gen robot became available to a wider audience in March, you can now also pre-order the pro-model UBR-1 from Unbounded Robotics. April also saw some interesting developments relating to the future of robots in space. NASA signed an agreement with SpaceX for commercial use of their historic launch pad and some space-faring lettuce was delivered to the international space station by a SpaceX Dragon capsule. Also in April, DARPA launched its new Phoenix program that will work towards enabling assembly of modular satellites by robots in space. Military robotics also featured in the news this April, with a robotic “Porton Man” worth 1.1M£ designed to test protective clothing for the UK’s armed forces. Additionally, DARPA launched the Hand Proprioception and Touch Interfaces (HAPTIX) program to develop prosthetics with lifelike sensory feedback that could significantly improve the lives of many amputees in the future. Various robotics-related events took place in April, including Robohub’s Robots from Imagination to Market seminar and networking event at MIT, the WeRobot conference and the 2014 Xconomy Forum on “Robo Madness”, giving attendees an opportunity to explore and discuss such important issues as the diffusion of robots into society and the desirability (or otherwise) of autonomous operation. We must have been onto something when we did a Robots Podcast on FutureDairy for our agricultural series last fall, because robotic milking caught headlines on both BBC Radio 4’s “Farming today” and the New York Times this April. We launched RoboJobs: the new dedicated jobs board for the global robotics community, where you can now find a range of robotics jobs in just one place. Everyone’s invited to vote for their “People’s Choice” startup from Robohub’s startup competition in collaboration with Silicon Valley Robotics. Tell us what you think about autonomous cars in our new reader poll, done in collaboration with the Open Robotics initiative. Robohub’s most popular post in April was Adam Klaptocz’s Fukushima photo essay: A drone’s eye view, which allows readers a unique look at three towns affected by the 2011 disaster.